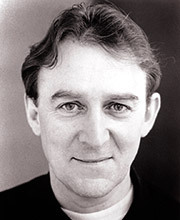 Dermot Crowley was born in Cork and began his career with RTE Radio. His theatre work includes The Weir in London’s West End and on Broadway, also seasons at the Royal National Theatre, Manhattan Theatre Club and Hampstead Theatre. On television his work includes Father Ted, The Sculptress, Falling For A Dancer, on film The Legend of Bagger Vance, Before You Go, Return of the Jedi. He works extensively for BBC radio.